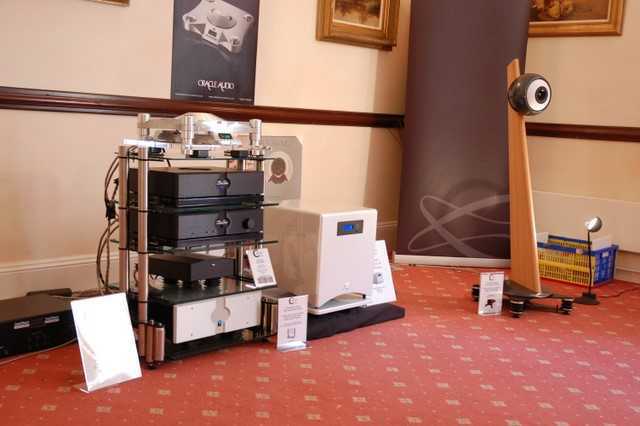 Chester Group, who used to organise the Heathrow hifi show, have decided to move that show to a new location and call it the 'National Audio Show'. The new venue is Whittlebury Hall in Northamptonshire, which is a pleasant enough place, easy to get to and with plenty of parking space, at least on Sunday morning. The hotel is spacious and the rooms seemed a little bit bigger and better than at Heathrow. We went on the Sunday and it was nice and busy without being overcrowded. Let me first tell you one thing: whatever you might think of the show itself, the accompanying website is certainly one of the worst I've seen in some time. Why people think playing an unsolicited piece of music or have submenus appear from nothing at the side of the screen is more important than a decent structure and simple, basic information is beyond me. You should have been able to 'reserve' a ticket online and get £2.50 off the entrance price. Only one of us managed to do that, but then just printed the document that he downloaded 4 times, enabling all of us to get in at the reduced price, unregistered! I actually should have been able to get a press ticket, but that didn't work at all. Another thing that could have been a lot better was the floor plan. It was too small and just showed a standard floor plan of the hotel with room numbers and an additional list linking exhibitors to room numbers. Finding out where a certain exhibitor actually had a room was a complete pain as it involved first searching the exhibitors list and then searching the whole floor plan of the entire hotel. It wasn't even possible to see which bits of the hotel were used for the show and which weren't. In the end we decided to just walk around until we thought we'd seen everything. So, there's room for improvement here. But for the rest it was actually quite good, and I do have to admit that I enjoyed it. It's not hugely different from the old show, but the location is fine and there was a good selection of brands present, even if some of the big names had decided to stay away. I'll give an impression of the rooms I visited, on Sunday September 27th. I wasn't able to go into all rooms, because we didn't have enough time, but I hope I was able to select the most interesting ones. Naim were demonstrating their new Ovator S-600 loudspeaker. This was setup in a standard size room, which was probably not large enough for it. As a result the bass was a bit boomy and unpleasant. The source was the new Naim DAC. As a system this sadly failed to impress us, certainly after a look at the price tag. The sound was a bit rough and flat. 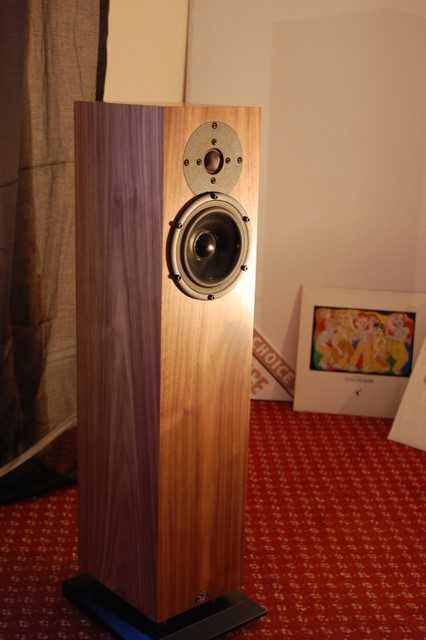 Word has it that the speaker has sounded even worse on previous occasions and that Naim has made a lot of progress. We do hope this will continue for a while longer. 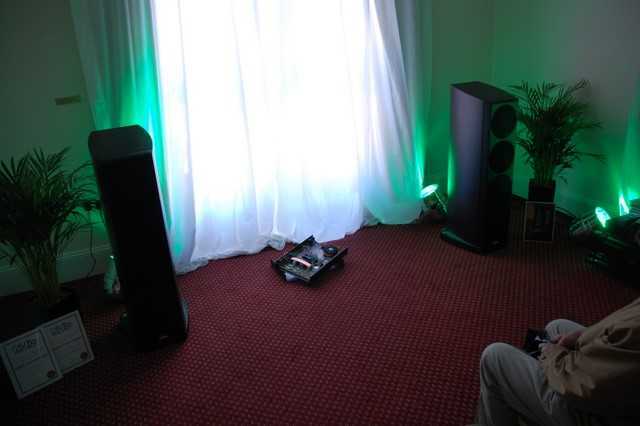 Many, many other exhibitors were using Naim equipment for their demonstrations, and in these other rooms it soon became clear enough that you can get excellent sound from Naim electronics, even in these hotel rooms. It must have been the brand with the most presence at the whole show, and virtually all the rooms using Naim sounded good, except the Naim Ovator room, sadly. The little Guru QM-10 speakers have been getting excellent reviews everywhere, so I was very keen to have a listen myself, and I have to say that I wasn't disappointed. These strangely proportioned minuscule boxes sound really punchy. There's more bass and slam coming from them than you could ever imagine coming from such a small driver. They really do sound very exciting and engaging. The top end is slightly edgy, but this wasn't a real problem. A bit pricy, perhaps, but very good sounding for sure. There was also an 'extension module' for the QM-10 and a bigger QM-60 speaker, but these were not being demonstrated when we were in the room. Still, that little QM-10 is a real performer and packs an unexpected punch. Kudos is a company that started making loudspeaker stands and now have a range of 6 speakers themselves. We visited the room twice: first when they were demonstrating the new, and very cute, X2 and later when they had hooked up the bigger C20. The little X2 impressed us immediately. This tiny speaker only costs £1250, looks fantastic and sounds great. 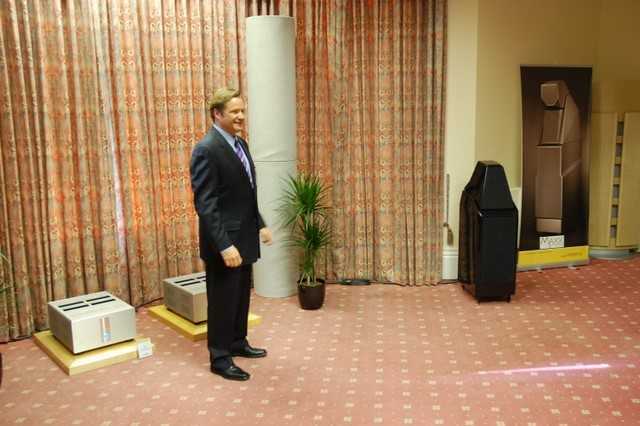 Obviously, the bass wasn't as deep and powerful as with a bigger, more expensive speaker, but more than adequate for the room. They sounded really excellent with some guitar music. Very fast and crisp, without being overly analytic. We requested a bit of rock and Yello (is that rock?) was put on the Naim modded LP12. Yes, these little miracles can rock too! If you are exclusively into head-banging hard rock you won't like them, but as an all purpose speaker these are great. Very lounge friendly, very articulate and fast, very pretty and very affordable. A real bargain and the best product of the whole show for me. We later returned for the C20. These turned out to be even better, although more than double the price. The C20 shares the good looks and the transparent, fast personality with the baby X2, but adds quite a bit more detail and air at the top, and a lot more welly at the bottom end. One of the best affordable speakers of the show, even if they look somewhat expensive compared to the excellent X2. I've reviewed all of Aurousal's speakers, so I was happy to find that they managed to produce an excellent sound in their room. 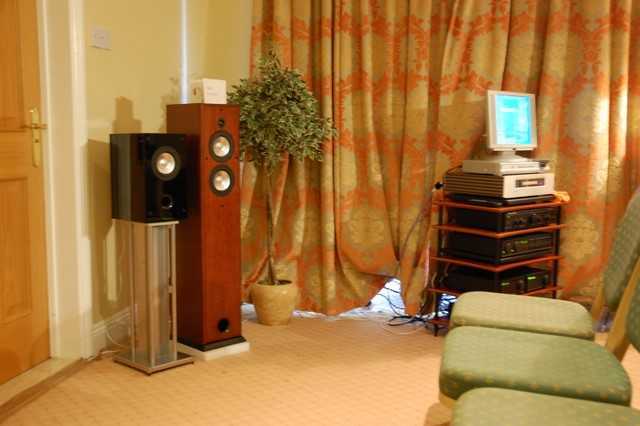 They used modest electronics: an Astin Trew At3500 CD player and an old Naim Nait integrated. Still, the overall sound was very good indeed, proving that you don't need to spend tens of thousands of pounds to get something special. The Aurousal VS floorstander was playing when we were there, and the sound was more than enough for the biggish room they were in. The speaker has had a slight update since I reviewed it, with a better capacitor for the super-tweeter. The open, natural and transparent personality of the Aurousal speakers never fails to impress me. 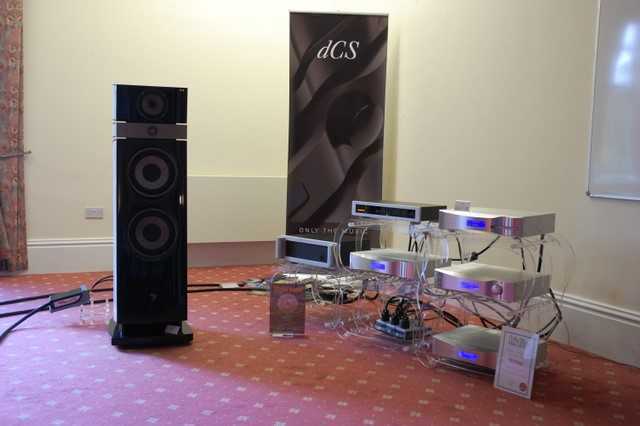 This was one of the best sub £5000 systems at the show. This room had a system with the MSB 'power dac' and the impressive and very costly Platinum Mono 200 Amplifiers. This was driving a pair of Harbeth speakers. The power amps look like a cross between a sea urchin and a UFO, and there was a column of warm air coming from each one of them. The sound was quite good, nice and natural if a little bit soft and slightly blunted. 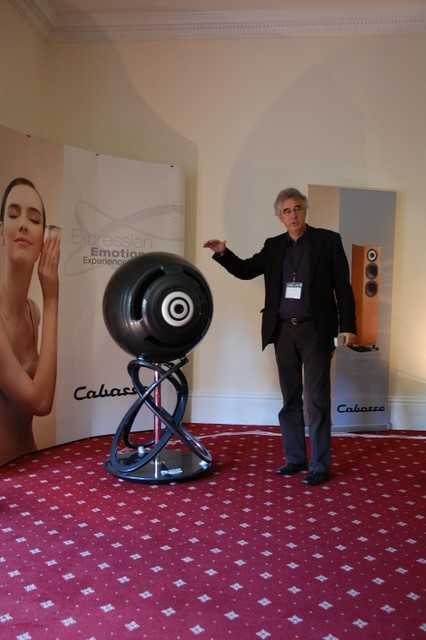 Cabasse had two rooms: a giant room for their giant 'La Sphere' statement loudspeaker, and a big room for the rest of the range. The 'Le Sphere' sounded very impressive, with the trademark Cabasse spaciousness and natural soundstage. It had copious bass and was outstanding with voices. This is a speaker for people with very, very big houses, and even bigger wallets. But in the room next door Cabasse proved that you can get a substantial bit of that sound for a lot less money, and in a very lounge friendly package indeed. 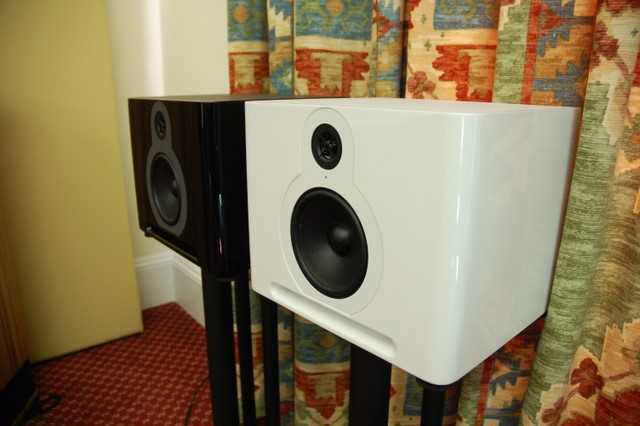 The smaller Riga speakers looked very swanky and sounded great too. The soundstage was absolutely fantastic. They use a separate subwoofer for the bass, obviously, but these must have been the best satellite system I've ever heard. Stylish, musical and even more or less affordable, what more do you want? In theory the Focal and dCS system should have been one of the best in show. The dCS digital front end is universally seen as the state of the digital art, and the Utopia loudspeakers are highly acclaimed. 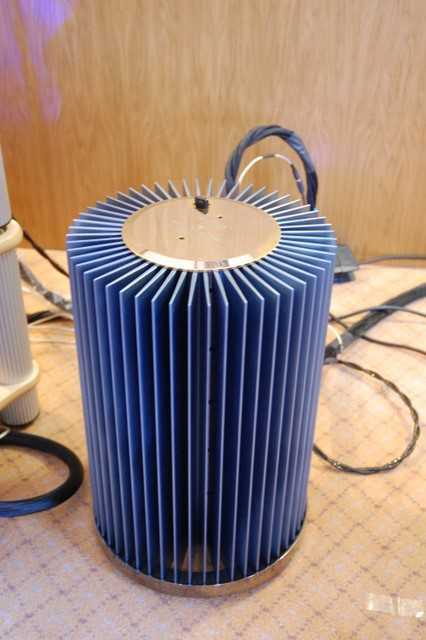 They were demonstrating the new Maestro utopia, which is a large three-and-a-half way speaker, using the famous Focal beryllium tweeter. We did find it to be a little bit harsh sounding, to be honest. It was a very big room, though, so this system might sound better in normal sized room. The amount of detail was staggering, but this system could never be accused of sounding sweet. Astin Trew is one of my favourite brands, and their room was one of the few proving that you don't need an enormous budget to get decent sound. 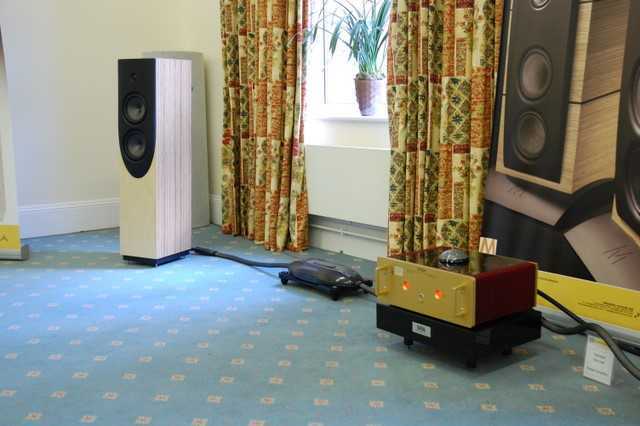 Michael Osborn was demonstrating two systems: one using the integrated At2000plus with stand-mounts and the other system using the preamp with bi-amping power amps driving a pair of Revolver floorstanders. Both sounded excellent. Astin Trew prefers a sound that will perhaps not impress immediately, but that satisfies in the long term. The sound was well balanced, warm and still detailed and exciting enough to draw you in. Just the way I like it. This was my favourite system of the show. It was the most natural sounding system I've ever heard. It simply didn't sound like hifi, just like real instruments. It was staggering. Of course, with an all Metronome digital front end and DatZeel pre and power amps this was an extremely expensive system. But at least it did deliver and sounded fantastic. It might even have sounded better in a smaller room. Still, I have never heard a more convincing replay of acoustic instruments as from that system in that room. Wonderful. This was a ticketed presentation, with introductions by representatives of both Krell and Wilson Audio. 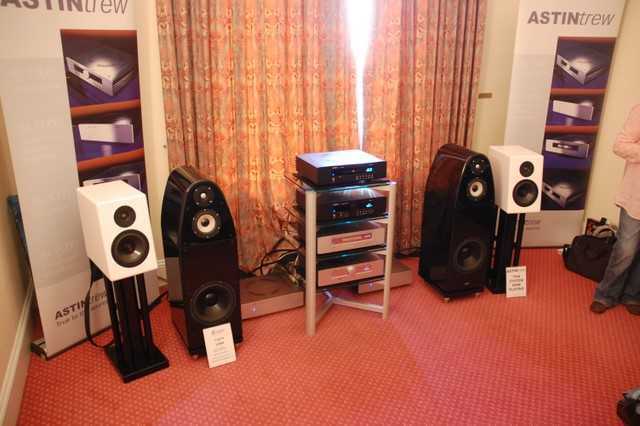 Krell had set up a system using their Evolution line of electronics and Wilson was introducing their new Sasha speaker. The sound was impressive, even if I did feel there was a slight gap in the soundstage. Dynamics were incredible and levels of detail amazing. But, somehow it failed to impress me to the same extend as the Magico / DartZeel / Metronome system in the next room. Slightly unprofessional was the fact that our demonstrator had clearly failed to make a note of the volume settings for his demo tracks, and he kept adjusting the volume during the final track. A colleague then completed the disillusion by switching all the tube lights on about 20 seconds before the track ended. I was also a little bit disappointed by the fact that, in spite of this being a ticketed event, people continuously kept coming in. Somehow I had expected more from the two biggest names in high-end audio.